Yes, I looked it up, MOJOES is the plural of mojo. This morning at breakfast I told DH that I was going to the Gaithersburg Doll Show tomorrow to try and get my doll mojo back. He questioned whether or not it is possible to have two mojoes going at the same time or if my embroidery mojo would depart if I my doll mojo returned. I know this blog is entitled, “My Doll’s Trousseau” and the main focus is collecting and costuming dolls. But, I freely admitted in my earliest posts that the 17th century embroidery bug had bitten me as well and vowed that it wouldn’t take over the doll discussion. But it practically has taken over. I am finding that studying, experimenting with and planning for my embroideries is more exciting to me right now. I have to wonder if the fact that the Gaithersburg Doll Shows have decreased from 4 per year to a miserly 2 has contributed to my waning attraction. My interest in doll collecting as as adult started about 25 years ago. Have I just exhausted the subject or has the charm, playfulness and excess of 17th century embroidery outshone the narrow world of antique dolls? Both doll collecting and embroidery are mainly considered to be women’s or girl’s subjects. People look at you like you’re strange if you bring up either subject. The people involved in both endeavors can be nice or nasty, pedantic or playful, friendly or self involved, generous or stingy, serious or lighthearted, kind or rude… Just like everyone else. But somehow, I take more offense at negative behavior by doll collectors. It’s just playing with dolls, people! My interest in dolls paralleled a general renewal of interest in doll collecting that peaked in the 1990’s and has been dropping ever since. Interest in embroidery is just beginning to see a renewal worldwide. Am I just a follower of trends? Or has the doll world become repetitive and narrow after so much time? 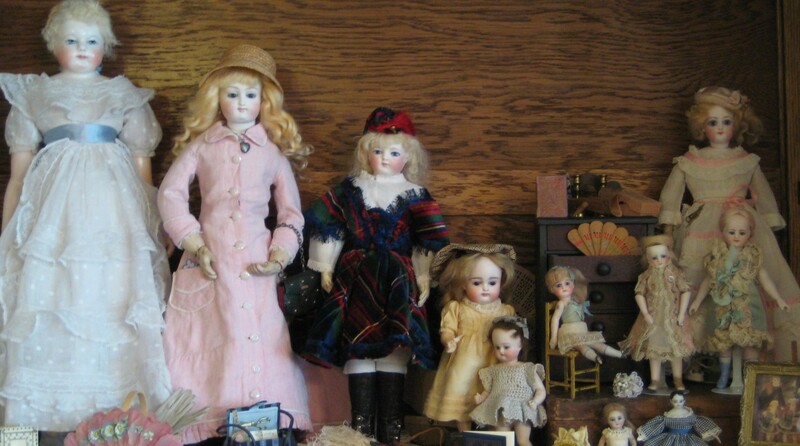 Costuming antique dolls “properly” has it’s limitations and rules. In studying 17th century embroideries, I have found that the same item is rarely stitched that same way twice. The different styles and types of stitches are seemingly endless. There are virtually no limitations or rules. Both attract creative people. I now count doll artists among my friends. And I am currently enjoying getting to know several very colorful embroidery artists. I am challenged by the lack of rules in embroidery. It was always safer to create doll costumes with defined, historic ideas of how they should look. The freedom associated with designing my embroideries is overwhelming and very exciting. DH has been gently coaxing me to relax and explore my creativity further. He’s getting a real kick out of watching me let go. I will go to the doll show tomorrow. I will attend the UFDC national convention in July. But I will also attend the EGA (Embroiders’ Guild of America) national convention this November. I spent years making and selling antique reproduction dolls until I tired of it and was able to freely let it go. Every now and then I look into my doll cabinets and question whether or not I am ready to let them go. Nope. Not now. No way. But they may have to wait a while for new outfits. Long ago, I wrote a post about how I approached doll shows. I explained that I first found them so overwhelming and enticing that I got in the habit of picking one thing to focus on throughout the show. Tomorrow, my focus will be on rediscovering that overwhelming joy that I found long ago. I love my doll friends and hope they will have patience with me as our paths diverge. I’m not abandoning my doll-collector readers. I will share my new discoveries with you and try to write about sewing and costuming secrets more often. Maybe I can handle two mojoes at once. But, I may be ready to move on soon. Just not yet. Thank you. I agree about the self-fulfilling prophecy bit. But dealers have moaned in front of customers since I was a dealer 20 years ago, in the doll collecting heyday. They probably thought I was rude when I didn’t join in, but walked away. I’m headed to G-burg tomorrow too in hopes of getting my mojo back too . I pulled shoulder muscles & have not been able to do much , including sew . I’m looking for a 50’s 18″ Sweet Sue to sew for . I have an old pattern & some new ones reissued by Butterick . Thought this might be a nice change of pace from sewing for French Fashions !